With a growing number of investment professionals in a fierce competitive environment, family offices and private banks are demanded to showcase an increasingly higher level of resources and skills. We strengthen your value proposition and help you distinguish your management methods from those of other financial institutions by using artificial intelligence and giving you access to tools such as proprietary selection criteria. We commit to your good governance practices by bringing transparency and flexibility to your methodologies. The usage of Quantilia’s qualitative solutions enables your to reach predefined targets and stand out from the crowd. 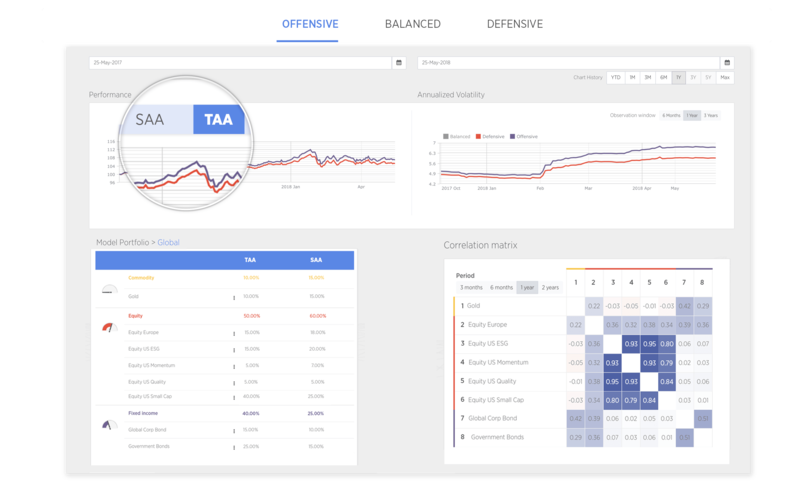 Our tools are developed with the aim of boosting your performances and easing the simultaneous management of different risk profiles. Our web based solution allows you to master the art of redefining your portfolio objectives considering new market events, and make available an extensive range of dynamic and insightful tools to monitor and analyse your performance attribution. The acute understanding of clients’ preferences is critical for discretionary portfolio managers to direct investments towards the right objectives. Quantilia is offering you the ability to tailor mandates, private funds, portfolios and consolidate them at the constituent level. Our built-in intuitive search tool will assist you in short listing strategies and provide you with the needed flexibility to meet your clients' requirements and build long term trust relationships. The platform offers a wide range of portfolio optimisation and monitoring instruments. We developed a multitude of solutions allowing managers to either examine the historical performances of each of their simulations, use multi-dimensional simulations on parameters, or create profiles and compare different allocations. The platform also allows you, inter alia, to use peer, redundancy and loophole analyses.